There is loads to discover on the route around Lake Vänern, Scandinavia’s largest lake. Whether in the vibrant metropolis of Gothenburg or in the fishing villages of the skerry coast, drivers and caravaners will immediately feel a sense of wellbeing. The many visitor attractions and comfortable campsites along the route make the journey an entertaining experience. Gothenburg, the starting point of the route, is easily reached on a Stena Lines ferry. From there the route heads northwards (with stops in small fishing villages and islands in the archipelago) to Strömstad. You then continue inland to the west coast of Lake Vänern, which you follow up to Karlstad before continuing around the east side of the lake to Trollhättan and finishing the route in Gothenburg. This port metropolis is the second-largest city in Sweden and one of Scandinavia’s most attractive. Experience the city’s heart and soul in its many attractive squares, such as Gustav Adolfs torg and Götaplatsen, with its elaborate Poseidon Fountain. Gothenburg boasts a wide range of museums, visitor attractions, interesting buildings and places to shop, enabling every visitor to find the perfect souvenir. The area between Gothenburg and Strömstad ranks among the most beautiful of Swedish landscapes. 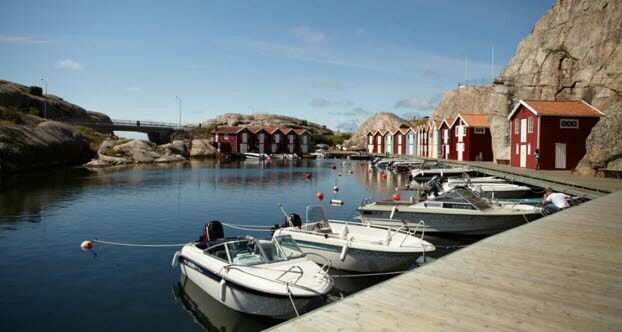 Be charmed by the skerry coast and picturesque fishing villages such as Marstrand, Skärhamn and Smögen with “Falun red” timber houses on granite rocks behind fishing boats and yachts – pure idyll. You should take the opportunity to stop off at one of the many good restaurants along this charming route. For example, why not try Tanums Gestgifveri in Tanumshede, Hummerkrogen in Hunnebostrand, Sea Lodge in Smögen, Apertin Herrgård in Kil or Restaurang Sjöboden in Spiken? Many restaurants offer tasty shellfish and local fish dishes.